Nature, Neighbors Guide Composer's Notes Phillip Bimstein blends the voices and sounds of his hometown and Zion National Park in southern Utah to create songs. 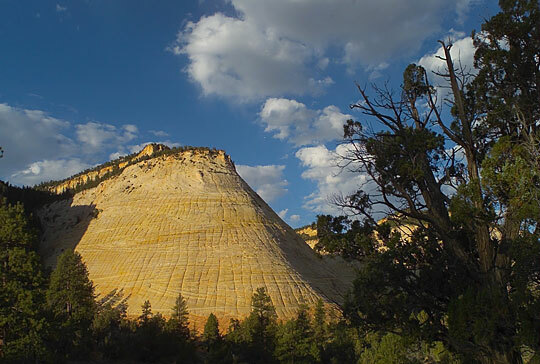 A "Half Moon at Checkerboard Mesa," is a musical hike through the sounds of the park. From Yellowstone and Yosemite, there are more than 84 million acres in the National Park system. Composer Phillip Bimstein celebrates the human and natural landscapes in and around Utah's Zion National Park with music that features the area's stories, voices and natural sounds. "Back and Forth (A Ghost Story)" recounts the childhood experience of Vilo DeMille. Performed by Red Rock Rondo. 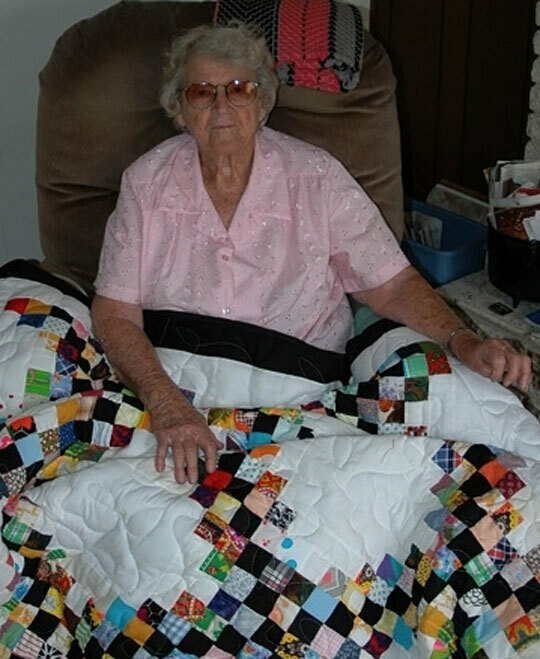 "Back and Forth (A Ghost Story)"
Quiltmaker Vilo DeMille's story about ghosts in the ghost town she lived in as a child was transformed into the song "Back and Forth (A Ghost Story)." 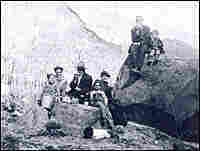 Bimstein (far right) with DeMille (seated) and the group Red Rock Rondo in the Grafton, Utah, cemetery outside Zion National Park. The first "moovement" of Garland Hirschi's Cows, Bimstein's concerto for rancher and cow. The voice of rancher Garland Hirschi and the moos of his cows were transformed into musical notes in Bimstein's alternative classical piece, Garland Hirschi's Cows. 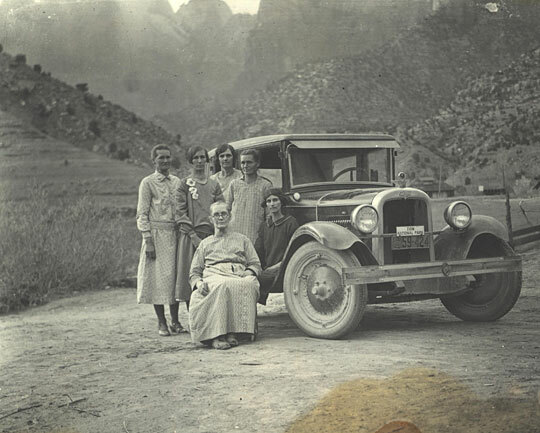 "When President Harding Came to Zion" tells the story of Carnelia Gifford Crawford, who farmed in what is now Zion National Park for 50 years, until her sons sold the place to the U.S. government so that Zion could expand. 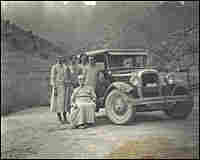 "When President Harding Came to Zion"
Carnelia Gifford Crawford (seated, center) and her daughters pose with a 1926 Chevrolet on the family farm that would soon become part of Zion National Park. 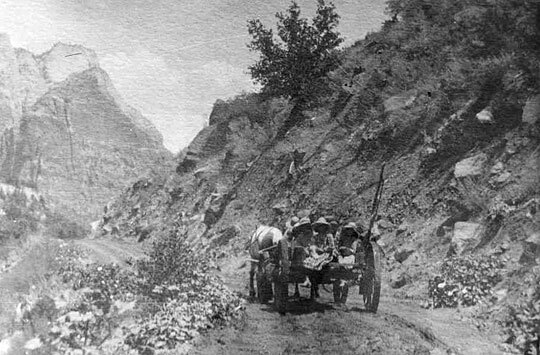 The Crawford family heads up Zion Canyon in 1923. 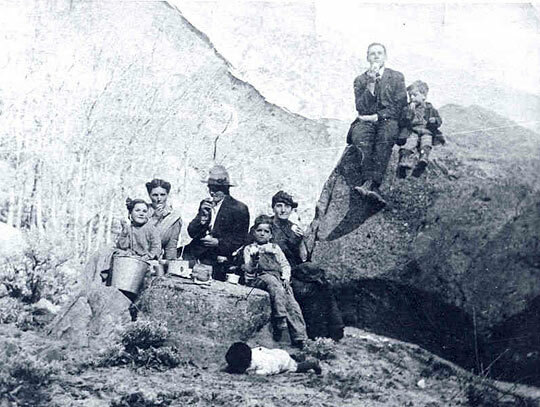 The Crawford family picnics in Zion National Park near the family farm in 1917, eight years after the park was established. 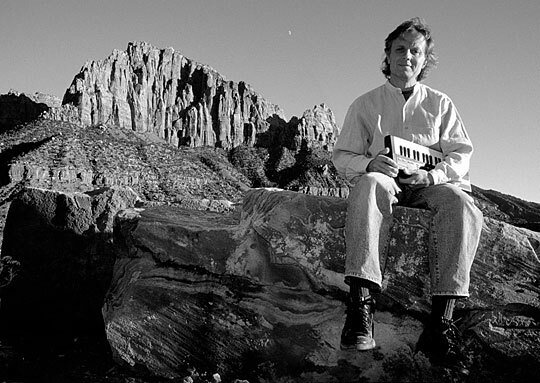 "Half Moon at Checkerboard Mesa" combines the oboe of Stephen Caplan with the sampled and synthesized sounds of frogs, crickets, coyotes, flowing water and scraping rocks recorded in Zion National Park. "Half Moon at Checkerboard Mesa"
Checkerboard Mesa, the sandstone formation in Zion National Park, that helped inspire Bimstein's song. "When the Rooster Crows (Company's Coming)" features the words and voice of Leon Lewis, a rancher and former elementary school principal in Springdale, Utah, the town just outside the main entrance to Zion National Park. "When the Rooster Crows (Company's Coming)"
Phillip Bimstein was a successful new wave rocker with Phil 'n' the Blanks 20 years ago when he hiked in Zion National Park in southern Utah. The Chicago native was so smitten with Zion's skyscraping sandstone cliffs, narrow red-rock gorges and desert river, he bought a house in Springdale, Utah, a town with a population of 550 located just outside the park. In the years since, Bimstein was twice elected Springdale mayor. He was even named the area's "composer-in-residence," generating a mix of alternative classical works and lyrical ballads focused on the people, history and sounds of the National Park and the town now dependent on park visitors. "These songs offer to people ... an entree into a more grounded understanding of the community that makes up Zion National Park," Bimstein says. "Zion National Park is not only the rock and the river. It is also the wildlife and the people who live there and have shaped the place." Some of the wildlife is featured in "Half Moon at Checkerboard Mesa," which includes the sounds of frogs, crickets and coyotes, as well as the water of Zion's Virgin River and scraping sandstone rocks. The natural sounds were sampled and synthesized in a computer and transformed into musical notes. An oboe provides melody.
" 'Half Moon at Checkerboard Mesa' is ... a musical hike through the sounds of Zion National Park," Bimstein explains. He recorded the sounds for the piece on his own hike in Many Pools Canyon, where water-filled, slick rock "potholes" attract wildlife. "I was just trying to make it like this oboist going for a walk through this canyon and encountering these frogs and coyotes and crickets and kind of collaborating with them." The composition celebrates what the composer describes as the rejuvenating power of a National Park hike. 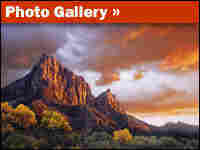 "Zion National Park and all those critters in Zion have spirit. And so when we go to a National Park and we see those sights and we hear those sounds and we see those animals it helps us to regain our own spirit." 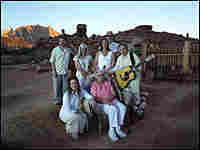 Bimstein's music also focuses on the human landscape in and around Zion. 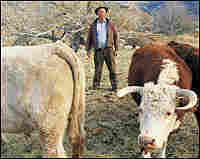 Garland Hirschi's Cows, a kind of concerto for cow and rancher, was an underground, alternative music hit in the 1990s. Garland Hirschi grazes cows in the pasture next to Bimstein's Springdale home, and the composer blends the rancher's voice, his cows' moos and musical notes derived from both. "I found a man whose voice and stories totally expressed the experience of growing up in the presence of Zion National Park," Bimstein notes. "He grew up before there was electricity there ... He had raised his cattle up on the mesa there between Zion and Arizona. His family had raised crops right in the shadow of the park. And everything they ate they grew." Bimstein's more recent compositions are conventional ballads based on other local characters and their stories. Some songs include lyrics using the exact words of the people involved and some use their voices. Rancher Leon Lewis, who spent 31 years as principal of the Springdale Elementary School, sometimes recites his part live when Bimstein and his group, Red Rock Rondo, perform "When the Rooster Crows (Company's Coming)." The title and song grew out of a stroll in Lewis' barnyard. "He took me to where he had ... old license plates on the side of his barn. And where he had 17 chickens that laid green eggs," Bimstein recalls. "One of the roosters let forth with a crow and he said to me, 'When a rooster crows, that means company's coming ... and I guess that's true because company's here." "The reason I chose Leon is because he ... knows the community intimately through the children who have grown up there," Bimstein explains. "He also ... knows the community through its original agricultural roots." The transition from agriculture to tourism is a theme in other songs. "When President Harding Came to Zion" recalls the 1923 visit of Warren Harding, who was trying to attract more attention and funding for the relatively new National Park. Around that time, the sons of Carnelia Gifford Crawford sold the family's farm to the United States so that Zion National Park could expand. Crawford was bitter, and she is quoted in the song saying, "It's a poor government that drives an old lady from her home" and "Why can't they just let me live here until I die?" "Now I, as a person who loves the park and moved there to be near the park, am grateful for that land that they sold," Bimstein says. "But I understand her perspective. She was very angry and very upset because it had been her land for 50 years. And she didn't want to move off of it ... And I hope when people hear that song it helps them understand that perspective." One new ballad laments the long commute many Zion and Springdale workers now endure because the popularity of the place, along with tourism and park wages, makes closer housing unaffordable. Another mourns the loss of Springdale's mulberry trees to new homes and businesses. But some celebrate local legends, culture and people, including a longtime park superintendent who worked to build positive relationships with townspeople. 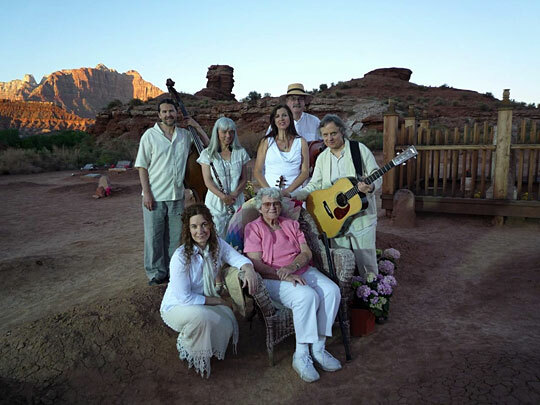 The new songs will appear on a CD timed for release as the town and the park gear up for Zion National Park's centennial celebrations next year. Red Rock Rondo, as both the CD and Bimstein's group are called, is scheduled for release in September. Bimstein's most famous musical subject seemed amused by the composer-mayor who records voices, stories, critters and rocks. "It sort of makes me laugh, some of the things he does," chuckled rancher Garland Hirschi in a 1997 NPR interview. "But he makes music out of them. I think it's OK as far as I'm concerned." Bimstein says the stories the music tells prove something important about National Parks and the communities linked with them. "There is more to visiting a National Park than the place," Bimstein asserts. "It's the history, it's the people and it's the life in the community today ... that can be just as interesting as the park itself."